You are here: information f.a.q. 3) How can I check my order status at EFoodDepot.com? You may check your order status online at EFoodDepot.com using My Account. Once logged in, click on My Account/Order History. 4) Can I change my order items once I placed an order? Depending on status of your order you may be able to change your order items. Please contact on Facebook. 5) Can I cancel my order once it's been placed? Depending on status of the order you may be able to cancel your order. Please contact on Facebook. 6) How long does EFoodDepot.com take to process an order? 7) Is the EFoodDepot website secure? What types of security features are in place to safeguard my information? Safeguarding our customer's information is a top priority at EFoodDepot.com. We have the strongest 128 bit SSL Pro encryption available from Veri-Sign, a trusted Secure Server Certificate provider. To learn more about secure server certificates, please go to http://www.verisign.com. We use our own in-house developed Biometric system to secure access to our customer service module. All employees at EFoodDepot have "need-to-know-basis" limited access to our customer's information. In addition, you may opt to have your financial information deleted from our servers, just simply call our customer service and we will take care of it for you. However, doing this will require you to re-enter your information on future purchases. 8) What happens when an item is out-of-stock? 9) How do I redeem my EFoodDepot.com Gift Certificate? Simply enter the Gift Certificate code during check out process. 10) Why do I have to pay surcharge of $1.00 when I order less than $20? 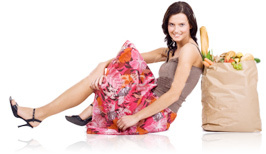 EFoodDepot.com wants to provide quality products and hard to find food items to all our customers at minimal prices. Due to the costs involved in fulfilling each order, we have no choice but to charge this norminal fee. Look at it from the bright side, since our prices are so low, the more you buy the more you'll save! 11) What is Rush Order Service? Rush Order Service is a service that provides our customers with same day shipping on orders placed before 12PM Noon Central Time. 12) Do I have to pay extra for Rush Order Service? Yes EFoodDepot.com charges $2.99 for each Rush Order Service. 13) Do I have to to incur the shipping charges in case my package got returned due to my absence? 14) Why my order status is showing as unconfirmed? Order status will show as unconfirmed due to Issues related to verification of credit card information or billing address. Our customer care representatives will always try to reach you at their earliest to resolve the issue. Until the issue is resolved ,your order status will be shown as UNCONFIRMED. 15) What should I do to confirm my account? Call in the customer service at 1-888-553-5650 as soon as you find the status of order is unconfirmed. Our customer care representatives are sitting next to you to resolve any kind of issues related to it in every possible way. 16) How long do you keep the orders in unconfirmed state? All unconfirmed orders are maintained for seven days. While we always do our utmost to reach you by phone and e-mail, we cannot maintain orders in an unconfirmed state indefinitely. If we cannot contact you within 7 business days of receipt of your order, the order will be canceled. 17) Can I reopen my order once canceled? Yes. Your order can be reopened once you call in the customer support and get the issue resolved which had caused your order in pending state with us. 18) Can I get discount coupons? Sure, we occasionally email out discount coupons for various special events. If you are registered with us, you will receive it too. 19) Can I use discount coupons to get further discounts on Bulk Buys items? Unfortunately the Bulk Buy items are priced very competitively so we generally do not offer any further discounts from that. So general rule is; unless otherwise stated specifically in the coupon offer that it is also eligible for Bulk Buys items, they are excluded from coupons offers. Currently we accept all major credit cards. Visa, MasterCard, Discover, and Amex. 2) Why must my credit card billing address match my shipping address? Due to an increase in Internet Credit Card Fraud, you should have the same billing and shipping address. We have implemented an Address Verification System that checks the credit card's billing address against the shipping address. If you have a separate shipping address, please call your credit card issuing company and add the additional address to your card. 3) Do I need to pay tax for my purchases? 4) How much tax do you charge for Oklahoma Residents? 8.375% will be charged as tax and it’s subject to change without notice. 5) Can I pay by Check, Money Order, Direct Deposit or Wire Transfer? 5) Does EFoodDepot.com ship internationally? Currently we have stopped our international shipments due to different regulations required by each country for shipping food products. 6) Does EFoodDepot.com ship to APO or FPO addresses? EFoodDepot.com may decide to pack your ordered items in separate package based on the type of products, weight and size concerns for packages. By Mail: Food Depot Corp.
West Covina, CA, 91790. U.S.A.
1) What is EFoodDepot's return policy on the products? All products sold by EFoodDepot.com are covered under our standard return policy unless otherwise stated. Our Standard Return policy is that customers may return the products within 21 days of original invoice date for unopened items within expiration date. Returns must be made using RMA Request located in My Account. All returns require RMA (Return Merchandise Authorization) number. Due to the nature of food products, we do not accept return on opened items. 2) Can I return if a product has expired? 3) Do I have to pay for return shipping fee? Yes, EFoodDepot.com does not cover the return shipping fees for return items! 4) How do I check the status of my refund? 5) Can I do an exchange?